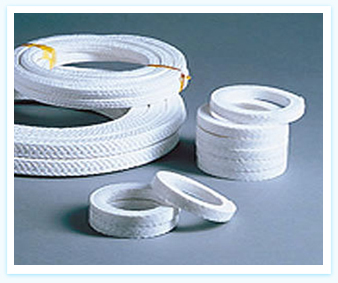 Pure PTFE Teflon� Packing - Special Grade, PTFE Products, Maharashtra, India. A special tough 100% Pure PTFE Packing impregnated with special ultra chemical inert suspension. The Teflon� packing is diagonally braided. Our special impregnation process increases compressibility and recovery factors. This Teflon� packing responds readily to pressure changes and forms a long lasting gland seal having very low coefficient of friction. A good packing for control valves even under high pressure conditions, reciprocating rods, pumps handling corrosive gases, solvents, acids, hydrocarbons, ammonia, food -stuffs and pharmaceutical industries. Not recommended to use on molten alkali metals such as Sodium, Potassium and gaseous fluorine as these can attack at high temperatures and pressures.